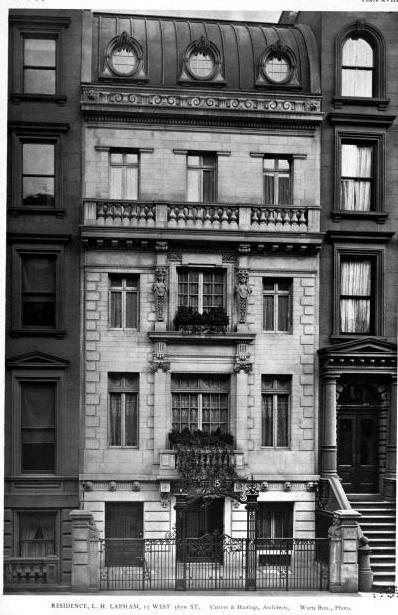 The Lewis Henry Lapham residence designed by Carrere & Hastings c. 1900 at 15 West 56th Street in New York City. Lapham was a founder of the Texas Oil Company, later Texas Corporation. The home has since been demolished. Photo from Architecture, 1903. Even on a bad day, they were better than, well, you-know-who---rhymes with filbert. Now that is unfair. Ughh this is going to be a very long year, lol. This is a complete miss by a legendary architectural firm IMO. Even the best had mis-steps. The 4th floor looks too high with a heavy balcony overpowering the 2nd and 3rd levels with their delicate but tacked on ornamental details all of which bears down upon the entry level seemingly crushing it and pushing it into the ground. Just look at the adjacent brownstone with its ornate entry surround and grand entrance doors. The Lapham home has a tiny black hole as its main entry. The individual elements are nice but put together in this arrangement? Come on? You really believe that the Flethcher-Sinclair townhouse on 5th Avenue and Delamar's Madison Avenue townhouse are inferior compositions to this awkward design? Ughh, what do they put in the water up there in Maine? Cheers. Notice that in the Uplands comments I managed not to mention anything about our friend. I noticed........and the Tobin Clark home near Uplands is just magnificent. How anyone could admire that english masterpiece and not see the equal beauty in CPH's Delamar townhouse, shaking ones head, I guess it is the water afterall. Well we can agree to disagree. I am also posting too much. Where are all the other CPH admirer's? Here...but I don't have the expertise as the rest of you...but I love the work I've seen of his....especially Pembroke. But I think we're the minority. I'm a CPH Gilbert fan and would love to have a monograph of hi work publish or even a Facebook fan page started. 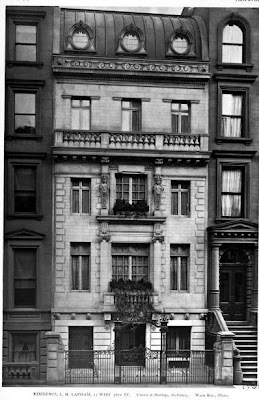 Unlike others of the time who seemed to pick sides, he moved easily from designing a house on Fifth Avenue or Riverside Drive.